Extraction system is a manufacture of essential oils which raw material has a small yield, damaged at high temperatures, and mostly soluble in water. Extraction normally used for essential oils of flowers. Some commodities that use essential oils extraction systems include roses, jasmine, and evening primrose. Commercial extraction of essential oils is generally performed with the solvent evaporated. Principle with the solvent extraction method is to dissolve essential oils evaporate within the material of volatile organic solvents. Solvents which can be used include alcohol, hexane, benzene, and toluene. In addition, it can also use a non-polar solvents such as methanol, ethanol, chloroform, acetone, petroleum ether, and ethylacetate with high levels of 96%. Tools used in this method is an extractor which consists of rotating extractor tube and evaporator tube. Extractor and the evaporator tube is equipped with a pointer of pressure and temperature. Inside there is a rotating extractor organic solvent inlet and the pump. Meanwhile, the evaporator inlet is made closed so that no volatile solvents. 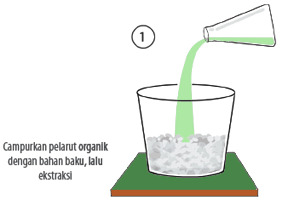 Enter a fresh raw material into the extractor and soak along with an organic solvent (eg hexan). 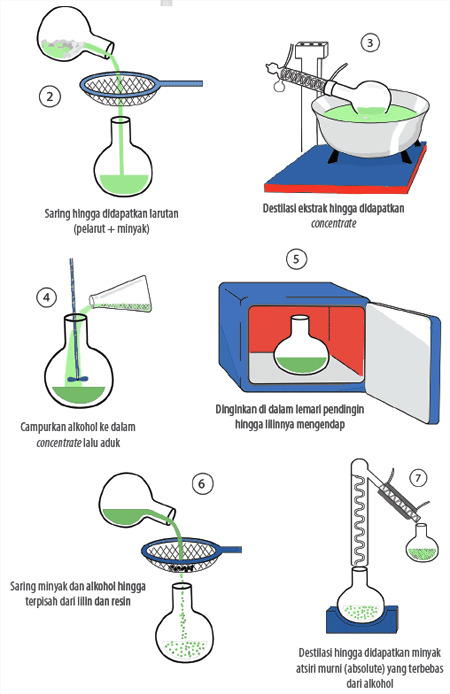 The solvent penetrate inside the raw material and dissolve some substances such as oils and resins, waxes, and dyes. For jasmine, carried out for 1 hour immersion, while the roses soaked for 12 hours. Turn the extractor for 20-60 minutes, then separate the solution from the extraction residue. 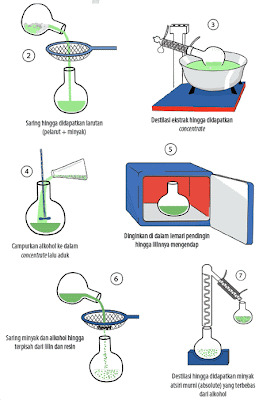 Perform vacuum distillation in the evaporator at a temperature of 45 ° C.
The solvent will evaporate and leave the solution is red-brown semisolid called concentrate. This solution consists of essential oils, waxes, and resins. Stir and dissolve the concentrate in alcohol 95% which can bind to essential oils. Refrigerate concentrate at a temperature of -5 ° C in a refrigerator until the wax settles. After that, strain to obtain the solution. Perform repeated distillation in vacuum conditions at a temperature of 45 ° C to separate the oil with alcohol that bind to the resulting pure essential oils.